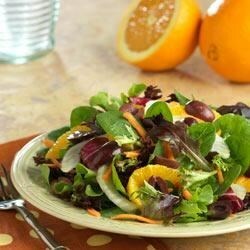 "Salty kalamata olives balance the sweet orange in this salad. The tangy orange vinaigrette brings it all together." This is a wonderful salad with a pleasing combination of orange and fennel. I used a ready to use herb salad mix, and it was warmly received at a dinner for eight. Added feta cheese squares. And used Trader Joe's Orange Champagne Vinegar as the salad dressing starter. Tasted lovely. Will definitely make this again. Like this recepie very much! I am doing it second time. This time instead of salad I put grated carrot. Also instead of sugar I put honey. Everyone love it! What a light and refreshing salad! I made this as directed, and wouldn't change a thing. Thanks for sharing the recipe!